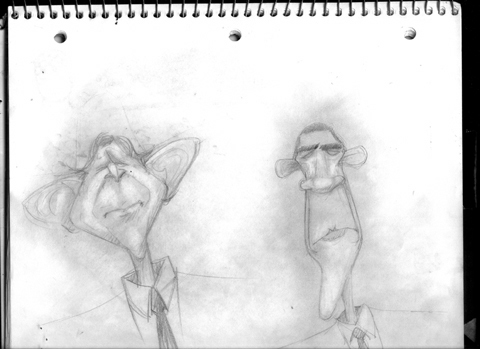 This in one of my sketchbooks I've filled up over years. This is one dates September 29, 2009 through March 22, 2010. * Each page is 9" x 11"
Well, I have to admit that offering up this collection of work is a bit trepidatious for me. It's like offering a psychological dossier about myself. I happen to be proud of the steps and lessons learned in this sketchbook because it represents where I'm at right now, 100%. Yet, it does show, in high detail, the random paths of a working illustrator. I'm aware that there are those that may think owning a bunch of half formed ideas might be similar to watching hotdogs being manufactured; the final result is satisfying, but the process is messy. I can promise you, though, the twists and turns of these images will surprise you and even delight you. How often can you peek underneath the hood of an illustrator that ranges from political art of Cox and Forkum to the whimsical nature of "Say What?"? 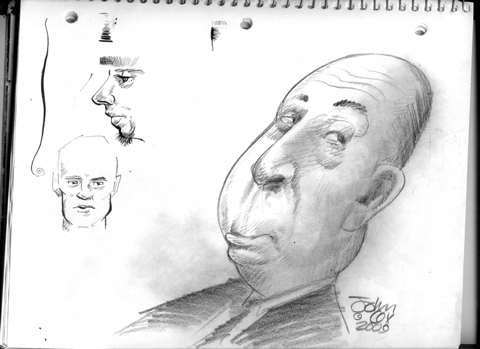 You will recognize quite a few sketches that turned into posts on my site during the time period I mentioned above. 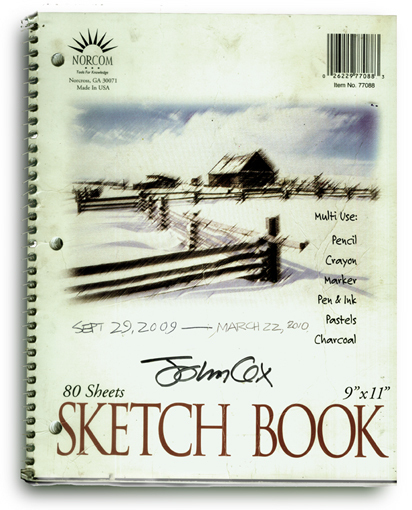 I believe the utter uniqueness of an artist's sketchbook is virtually sacred and I'd like one of y'all to have it in your home as evidence that the creative process is a living, breathing thing. * Bidding will start at $270. * The comment button at the bottom of THIS post is the ONLY way to make your bid official. I won't accept bidding any where else. * The final bid will be determined by the time stamp on your bid. Cutting it close to the final minute is not recommended. * If someone wins the bidding and chooses not to follow through with payment, I will offer the sketchbook to the next highest bidder. Wow. Thanks for the privilege of trying this. Let's see what happens! I am happy to open the bidding by placing the first bid at $270. I've been "stimulated" out of another cool piece I'd have liked to have had. Happy bidding, everybody--& good luck. If I believed in using expletives for exclamation, there would be one right here. Thanks for kicking this off so quickly. GOOD LUCK. John, here is an idea: Auction the original so the winner truly gets a masterpiece, but publish it and we would all probably buy the published edition - especially if it was autographed. I would be in for $25 (or maybe higher) for the published version. Thanks for your participation! 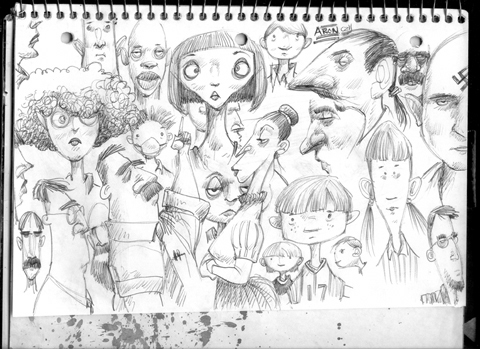 This one-of-a-kind sketchbook is all yours. Please contact me at my e-mail address: john555cox@hotmail.com and state your mailing address and I'll send it along immediately once I recieve payment. Thanks for kickin' this thing off. Let me know what you think of this offer. 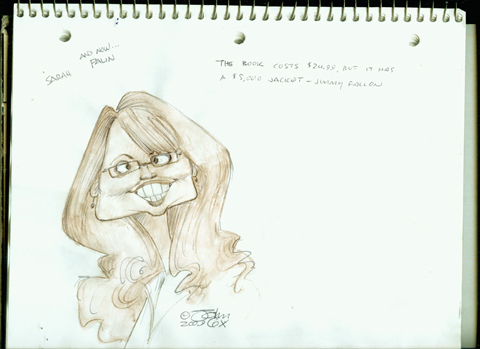 I have other sketchbooks from my early days that I may offer if there seems to be any interest. Thanks for your patience and I'll get started with the regular stuff immediately. I go away for a couple weeks and this happens. Alas. I'm sure I'll get around to another one of these. Now wish to be socially responsible. a problem, I bet you’re tempted to ask – - to stay true to our designers, we must look authentic Coach Fashion Replica Handbags at any cost and talk about costs, it is possible to buy the legendary coach at a discount? However, these Replica Louis Vuitton Discount Handbags are not practiced by some people because of the high price. This page contains a single entry from the blog posted on February 13, 2011 10:29 PM. The previous post in this blog was Along The Watchtower. The next post in this blog is REMINDER: Auction ends at 9pm tonight.